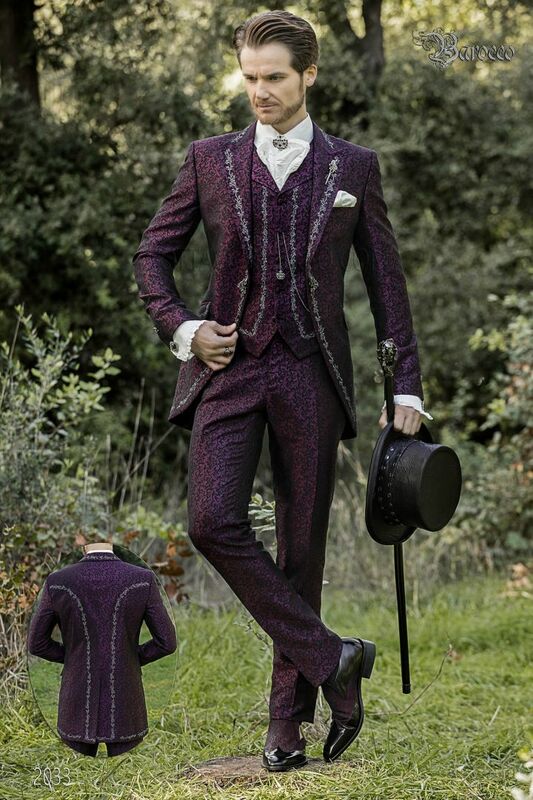 Purple jacquard brocade italian bespoke groom suit with silvered embroidery on the front side and the back side. Peak la... Purple jacquard brocade italian bespoke groom suit with silvered embroidery on the front side and the back side. Peak lapel, one vent at back, Redingote-style seams and rhinestone frog closure. Waistcoat with lapel made from brocade purple fabric with embroidery. Purple brocade waistcoat with vintage Baroque lapel. 5 covered tonal buttons and 2 double welt pockets. Black and Silver... Purple brocade waistcoat with vintage Baroque lapel. 5 covered tonal buttons and 2 double welt pockets. Black and Silver floral embroidery on the front and back lining with elastic band to adjust width. White crushed plastron tie and handkerchief. White creased plastron tie with handkerchief set. Handmade. Two-coloured shoes made from black patent leather and purple brocade fabric. Nickel-tone crown cravat clasp with purple rhinestones. Silver-plated brooch with sword design and black stone embellishment.